Air Sick: Want to Feel Like a Billionaire When you Travel? Ever wanted to feel like a millionaire when your traveling, how about a billionaire. 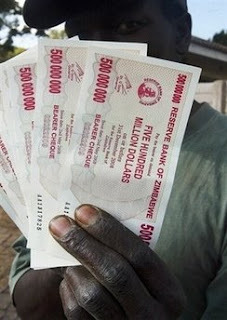 Zimbabwe's inflation is so bad the country has recently issued a 100 billion dollar bank note to go along with the new 500 million dollar note to adjust for the rapid economy. So if you really want to feel like a billionaire take a trip down to Zimbabwe. For a plus you can carry around a couple of billion dollars while your there, the down side, you hotel is going to cost about that also, and it isn't the high roller suite at the bellagio.